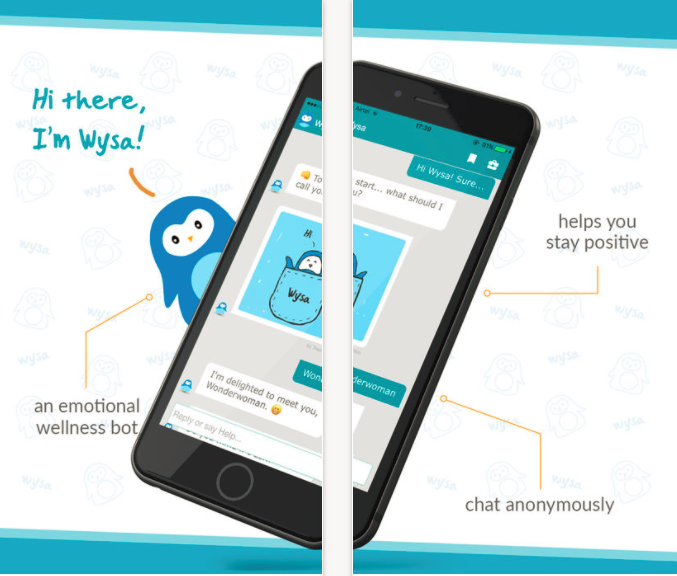 Wysa is a mobile app aimed at assisting users with symptoms of anxiety and mild depression through a virtual Chatbot that delivers messages utilizing principles drawn from CBT, and relaxation tools. Upon entering the program, users become acquainted with Wysa, a virtual penguin who initiates a chat and short mood-screening process. Wysa offers various tools to help users cope with distressing feelings. Users’ interaction with Wysa is in the form of a chat in which Wysa leads them through the suggested exercises. A toolkit is available for users to choose a more focused aim (e.g.“for better sleep”, “befriend your inner monster”). Additional features include video and audio segments with relaxation and yoga exercises. More engaging than most CBT apps/Free. Chatbot doesn’t recognize most language written by users. Wysa is a program with a friendly mode of delivery that is most suitable for users with mild distress (anxiety, depression). The chat-based program is more interactive and engaging than most of the mobile apps targeting mild distress that utilize CBT principles. There is a nice mix of audio tracks and videos. On the downside, even though it is presented as a bot, the Chatbot has difficulty recognizing answers and languages the user writes down (even gibberish). This may result in inappropriate responses and may be frustrating for the user. Wysa could be recommended as part of ongoing treatment for patients dealing with mild distress who are already using similar techniques within treatment. The program could assist as between-session practice supporting the therapeutic process.